I was inspired by the witches hat bark I had seen on Instagram and then found even more versions on Pinterest too. 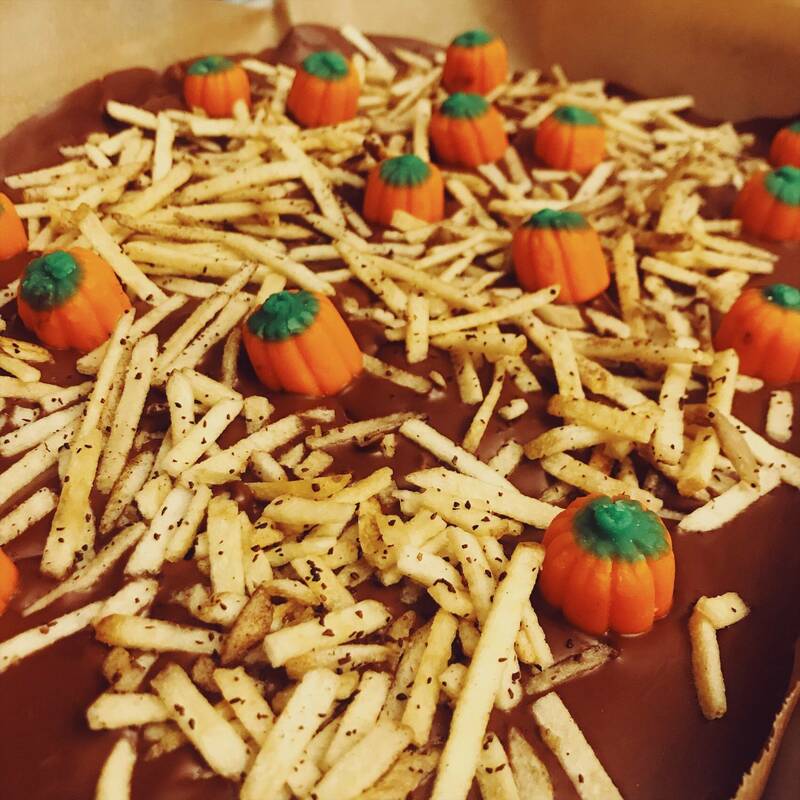 I decided I wanted to make my own seasonal chocolate bark and made a pumpkin patch. It is so easy to do. Fill a saucepan 1/2 way with water. Find a heat proof bowl that can sit atop the saucepan without falling in. Put the bowl on the saucepan and heat the water until it boils then reduce to a simmer. Break chocolate into small pieces and place in bowl. Let chocolate melt over the steam from saucepan. Make sure no steam or water drops get into the chocolate. You could also melt the chocolate in the microwave 30 seconds at a time, mixing well in between. Place parchment on a small sheet pan or tray. Pour the hot chocolate on the parchment and carefully spread it out thinly (about 1/4 inch thick.) Keep one blob of chocolate aside. If using cinnamon, add a pinch of cinnamon to the tin of potato sticks and shake it all up. Spread the potato sticks over the hot chocolate. Leave a few spaces for the pumpkins. Gently press the potato sticks into the chocolate. Place the candy pumpkins among the potato stick "hay." 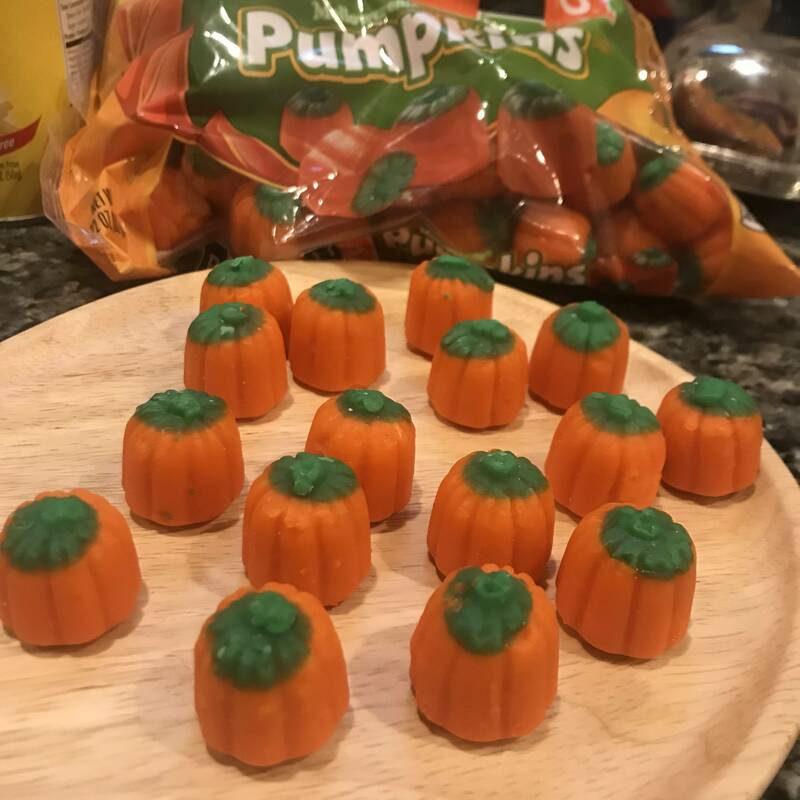 If you need a little extra chocolate to "glue" a candy pumpkin in place, dip the pumpkin onto the extra blob of chocolate. Allow to harden for several hours. Break up into mini pumpkin patches and serve. Melting chocolate for chocolate bark, or any melted chocolate recipe, is very easy, until something goes wrong. The microwave is a fool-proof way to melt chocolate. 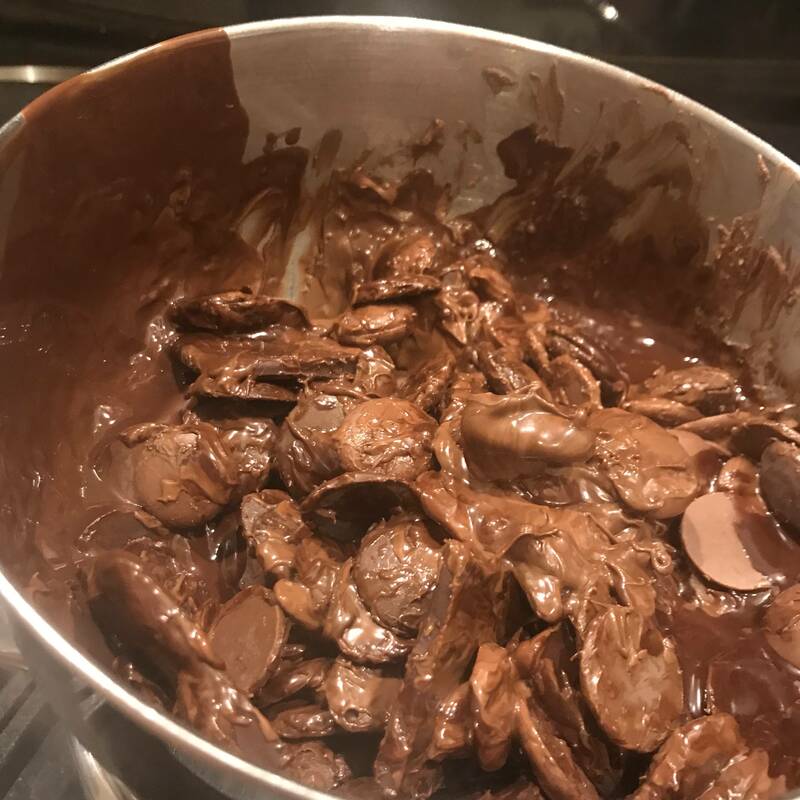 When you use a bain Marie (the steam bath method in my recipe), you just need to watch for getting any water in the chocolate which will cause it to seize up. You also want to make sure you don’t burn the saucepan dry so put enough water in before you start or add as you go. If you want to be really fancy. Keep one square of chocolate to the side and when all the rest of the chocolate has melted, add that last square. It will help the finished product stay nice and glossy. Why do we need to melt chocolate this way? Chocolate burns if melted over direct heat and burnt chocolate is not what you want in your chocolate bark treat. The sweetest little pumpkin patch. I used a 1/4 sheet pan for this but you can make as much or as little as you like.